Start with some of the most hard-driving and blue ribbon winning younger old-time musicians on the scene. Add their time spent visiting and learning at the feet of older masters. Combine a love of tradition with a desire to create fresh, meaningful old-time music, and you get the Blue Ridge Broadcasters. Comprised of some of the most inspiring, innovative, and engaging young musicians on the old-time scene, the Blue Ridge Broadcasters perform a mix of driving fiddle tunes and traditional songs. The members of the Broadcasters have been working together for over a decade, teaching, recording, performing, and competing. They have appeared together at The Appalachian Stringband Festival in Clifftop, West Virginia, winning multiple first place prizes in the traditional band and fiddle contests. The Broadcasters build on their deep reverence for Appalachian old-time music to create compellingly new sounds. They can crank out blistering fiddle tunes made to move dancers or draw out the mystery from a crooked, haunting melody. They can tease out the funkiness from a country blues. They can blend their voices into sweet harmonies, breathing new life into old songs. Building on a decade of making music together at fiddlers conventions, in bands, and on the road, the Broadcasters have combined their skills as multi-instrumentalists to share their love and knowledge of old-time music of the American South and the people and places behind it. Emily Schaad: Known for a complex and powerful fiddling style, Emily has taken first place in numerous stringband and fiddle contests, including the Appalachian Stringband Music Festival in Clifftop, WV. She came to the music of the southern Appalachians as a classical violist and public school string teacher, and once the archaic and driving sound of the fiddle and banjo found her, she never looked back. Originally from the Hudson Valley of New York State, she relocated to western North Carolina to study Appalachian culture and music at Appalachian State University. She was fortunate enough to spend time visiting with such old-time music greats as Clyde Davenport, Benton Flippen, Joe Thompson, and Chester MacMillian. From these seasoned musicians came a varied repertoire, a feel for Round Peak rhythm, and cherished stories and memories. Joseph Decosimo: Raised in East Tennessee, Joseph keeps the musical traditions of his region alive. In his teens, he spent much of his time with the region’s older fiddlers and banjo players, learning their music and stories. His time with fiddlers Charlie Acuff, Clyde Davenport, and other local players profoundly shaped his sense of the music. Drawing inspiration from these encounters and from the region’s deep musical well, he injects new life into the old tunes. A sought after performer and teacher, he has shared his music at festivals, camps, and venues throughout the country and abroad. His fiddling and banjo playing have won blue ribbons at the most prestigious fiddle contests in the South, including the Appalachian Stringband Festival. He is a National Old Time Banjo Champion. He served on the faculty in ETSU’s Bluegrass, Old Time, and Country Music Studies Program. A trained folklorist, he is currently writing a dissertation on old time music. Joe DeJarnette: Raised in Virginia’s piedmont and residing in the Blue Ridge, Joseph “Joebass” DeJarnette brings both rocksteady, driving bass playing and deep experience to the Mules. He has been playing and recording traditional American music for over a decade and knows how to draw audiences into performances of traditional music. As a founding member of The WIYOS, he toured the US, Canada and Europe. The only member of the band to have played dates on a Bob Dylan and Willie Nelson tour, he has connected with diverse audiences from stages at the Newport Folk Festival, to the Lincoln Center, to the Appalachian String Band Festival in West Virginia. Joe’s tasteful bass playing, musical acumen, and joyous stage presence put him in a category all his own. A veteran of festivals and camps, he directs the Augusta Heritage Center Old Time Music Week. Doug Sharkey: Doug Sharkey was born in central Illinois, where he studied classical guitar and began teaching music full time. After playing in a variety of bands, he found old-time music and became obsessed with the haunting vocals and syncopated clawhammer banjo. He moved to Boone, North Carolina to study with the masters of the region and became immersed in the old-time scene. While in Boone, he earned his Master’s in Appalachian Studies from Appalachian State University. He performed for a variety of dances and concerts and eventually taught banjo and for the Junior Appalachian Musicians (JAM) program, an after school program that teaches traditional mountain music to young adults. MountainGrass to Move to Beechworth. For many bluegrass and old-time music enthusiasts in Australia and New Zealand Harrietville has been the home of music for almost 30 years. Indeed many people have had their first exposure to the genre through their attendance at a Harrietville festival as far back as 1989 I believe. I will always fondly recall my first experience wandering around the grounds of the old Bon Accord, watching and marvelling at the music being played. When it came time to sit in on a concert there were folks there from the USA playing along with our own musicians. It was an extraordinary experience for me back in the early 90’s. The festival organisers of old had just about run out of puff in late 2012 and announced that Harrietville was to be no more. A group of extremely dedicated folk banded together and created a formal association called the Australasian Bluegrass and Old Time Music Association (ABOTMA). It was under the banner of this new entity that many people set about doing their best to present a festival the following year 2013. It was and amazing a success and continues to this day some five years later under the steady direction of ABOTMA. Today MountainGrass continues the tradition of bringing U.S. Bluegrass and Old-Time acts to play concerts and run workshops for fans and players of all levels. This festival continues to showcase a selection of fine acts from Australia and New Zealand and runs instrument and other workshops for players of all levels. We learn this week that Harrietville will no longer be the location for future MountainGrass Festivals. At the final Mountaingrass concert for 2017, festival organisers announced that the venue – Feathertop Chalet in Harrietville – would no longer be available for MountainGrass in the future. While there are several reasons for this decision, the over-riding issue is that the size of the festival today outweighs the facilities available at Feathertop and indeed across the Harrietville region. Organisers have announced this week that they have moved the MountainGrass Festival to the George Kerferd Hotel at Mayday Hills in Beechworth. The dates for the event are the second weekend in November – Friday 9th to Sunday 11th November 2018. In addition, organisers have been conscious of the benefits of moving the festival closer to festival dates in New South Wales – the Dorrigo Bluegrass and Folk Festival – with the aim of amortizing the costs of travel for international acts which have over time been a major draw-card for both festivals. The George Kerferd Hotel has a restaurant, bar and a large function room with seating for over 400. There is also a smaller 100 theatre available as well as a small chapel in the hotel grounds. The hotel is surrounded by acres of beautiful grounds, full of huge shady trees. The accommodation at the George Kerferd Hotel also includes the recently refurbished Linaker Lodge, previously the nurse’s quarters for the hospital that was located there. There are many open air and under-cover spaces for picking and conducting workshops. Mayday Hills is close to the centre of Beechworth, where there is a variety of accommodation, including two large caravan parks. Best of all, the proprietors of the hotel are very keen to host Mountaingrass. We are very grateful for the many suggestions provided by our members regarding possible future locations for Mountaingrass. We are confident that our choice of the change of date and location will meet with approval. We would like to thank the Alpine Shire Council and all our supporters and sponsors of ABOTMA’s Mountaingrass in Harrietville over the past five years. We also recognise the assistance and support provided by Harrietville over many years the festival has been running there prior to the inaugural Mountaingrass in 2013 – – ABOTMA Committee. Congratulations to those hard-working folk at ABOTMA, and thanks for working to continue the tradition of a major Bluegrass and Old-Time music festival in Australia. On behalf of the thousands of bluegrass and old-time music aficionados across Australasia – thank you. You can show your thanks and support by joining the association. The Women in String Bands album will be officially launched at Mountaingrass 2017 with a special concert on Saturday evening at 7:00 pm in the festival’s main marquee. This project was made possible through Folk Alliance of Australia. The aim of the project was to celebrate and promote women in string bands in Australasia and those who collaborate with and support them. Through this project, the Australasian Bluegrass and Old-Time Music Association (ABOTMA) aims to inspire and promote the participation of Australasian female musicians playing acoustic string band music. The Women in String Bands Project CD includes new and already published materials showcasing the creative output of Australasian women playing string band music rooted in bluegrass, old-time acoustic and other related folk styles. This project was made possible by the generosity of the Folk Alliance of Australia, ABOTMA, Alexander Bell Sound Studios and the artists involved. Sincere congratulations to all of those involved from Australian Bluegrass.com. The ABOTMA Annual General Meeting will be held Saturday 18th November, 5.15pm – 6.15pm in the Conference Room at the Feathertop Retreat, Harrietville, Victoria during this year’s MountainGrass Festival. All interested parties are welcome to attend, but only financial members (as of the 8th November) are eligible to vote. Please ensure you have a current membership. Memberships run the financial year and yours may have lapsed on 30th June this year. Any questions can be directed to info@abotma.org.au. Check in with the MountainGrass website for the full program going up soon, updates on the progress of the raffle mandolin, and other fun news. Tickets for MountainGrass are on sale through iWannaticket. Make sure you get your ABOTMA membership discount code before you buy your tickets. The Australasian Bluegrass & Old Time Music Association was founded in Harrietville on 27 April 2013, at the site where, for more than 20 years, musicians have gathered to play and share music at the foot of Mount Hotham in the Victorian Alps. ABOTMA has commenced building affiliations with bluegrass & old-time music organisations, teachers, and performers within the region and internationally, and in particular with the USA where these music forms originated. Over time, an Australasian ‘flavour’ will no doubt develop as the music evolves through local influences. The broad mission of ABOTMA Inc. is to support the teaching, performance, and promotion of bluegrass & old-time music. cooperating and collaborating with affiliated music organisations. Anyone is welcome to become a member and take an active role in contributing to the Association and its activities. MountainGrass continues the tradition of bringing U.S. Bluegrass and Old- Time acts to play concerts and run workshops for fans and players of all levels. MountainGrass also showcases a selection of acts from Australia and New Zealand and runs instrument and other workshops for players of all levels. Most of all, MountainGrass offers two and a half days of non-stop picking and jamming and lots of opportunities to improve your chops. Tickets available from this website. ABOTMA and MountainGrass have also announced that the 2016 IBMA Instrumental Group of the Year winners Frank Solivan and Dirty Kitchen are the headline act for MountainGrass 2017. Since Frank Solivan left the cold climes of Alaska for the bluegrass hotbed of Washington, D.C., he’s built a reputation as a monster mandolinist and become a major festival attraction with his band, Dirty Kitchen. Solivan, with banjoist Mike Munford, 2013 IBMA Banjo Player of the Year, award winning guitarist Chris Luquette and bassist Jeremy Middleton, simmer a Bluegrass/Newgrass stew from instrumental, vocal and songwriting skills so hot, they have been named IBMA’s Instrumental Group of the Year twice, in 2014 and 2016. Prepare to be delighted and wowed by their sweet blend of traditional bluegrass and outstanding musicianship with a contemporary twist. Award-winning and always crowd-pleasing multi-instrumentalist and songwriter Pete Denahy has brought his friends Montz Matsumoto (banjo, 2017 Tamworth Banjo Champion) and Hiroki Maeta (mandolin) to MountainGrass before, and they blew everyone’s socks off. This year they are joined by Tomoyuki Murata on guitar, with local Aron Maclean on bass to form a band they are calling “Wide Island.” The band name comes from a literal translation of “Hiroshima,” home town of both Pete’s mum and Hiroki. Wide Island will be releasing their first album, “Going Home,” an album of original songs penned by the band members and recorded in their various living rooms, at MountainGrass. These fast-picking, sweet singing gentlemen are guaranteed to add a truly international flair to the MountainGrass mainstage. Australia’s own raconteurs, Mustered Courage, have been delivering their diverse brand of roots music and bluegrass that appeals to both traditionalists and newcomers alike. The Melbourne based group that Music Australia Guide describes as “the link between Bill Monroe and Mumford & Sons” has risen to the top of Australia’s folk and roots scene on the strength of their energetic live shows and albums that have won them glowing reviews, loads of radio support and a “Golden Guitar” for Instrumental of the Year 2015 along with a 2015 ARIA nomination for Best Country Album. In 2016, the band’s supported their latest release, “White Lies & Melodies” on Lost Highway Music with a series of successful Texas style BBQ and music events. As Rolling Stone so aptly stated, “it’s inevitable that this band has a huge international career ahead of them”. Mustered Courage are already fulfilling that destiny with over 100 international shows under their belt. Bluestone Junction are exponents of traditional Bluegrass music. Sometimes fast and furious, sometimes slow and sweet, their bluegrass music is performed like in the old days – without pickups or amplifiers, and played around a single microphone. They are proudly releasing their third studio album, a collection of good old “Favourites” at the Festival. Bluestone Junction features Chris Jacobs on guitar and main vocal, Donal Baylor on fiddle, Pete Fidler on mandolin and dobro, Mick Harrison on the five string banjo and Mike St. Clair-Miller on double bass. Live and stomping, The Kissin’ Cousins bring a fresh, youthful Australian sound to traditional American bluegrass and Old-time music. Hard-driving banjo, melodic harmonies, twin fiddles and a whole lot of banter makes The Cousins festival favourites all over the East Coast of Australia. They do the gig that you can kick up your heels to but still bring your mum along. The Australasian Bluegrass and Old Time Music Association (ABOTMA) was formed in 2013 to support the teaching, performance and promotion of bluegrass and old time music in Australia and New Zealand. Everyone who enjoys bluegrass and old time music is very welcome to come along, improve their playing skills or simply enjoy the concerts. The first MountainGrass was held in November of 2013 and is organised by the Australasian Bluegrass and Old Time Music Association Inc. (ABOTMA Inc.) For over 27 years the small township of Harrietville has played hostto bluegrass and old-time music festivals. News From MountainGrass for 2017. The band name comes from a literal translation of Hiroshima, home town of both Pete’s mum and Hiroki. Wide Island will be releasing their first album, Going Home, an album of original songs penned by the band members and recorded in their various living rooms, at MountainGrass. These fast-picking, sweet singing gentlemen are guaranteed to add a truly international flair to the MountainGrass main-stage. 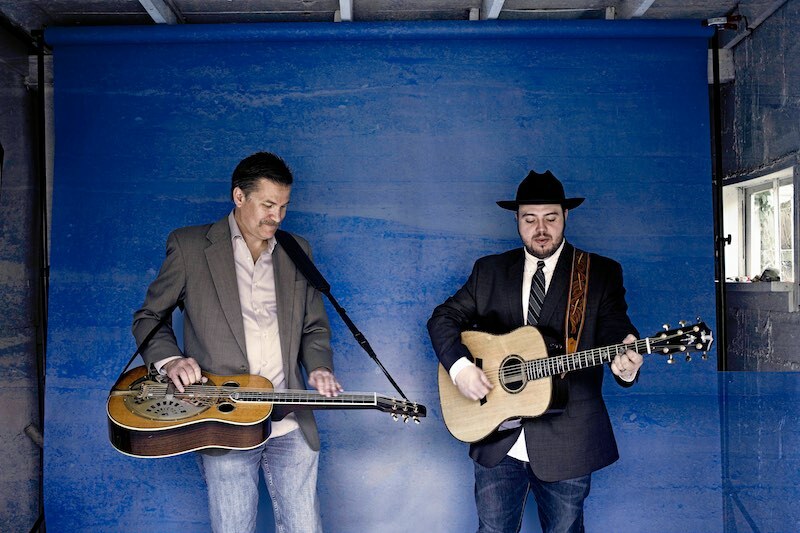 Grammy nominated duo Rob Ickes & Trey Hensley seamlessly blend contemporary bluegrass, the stylings of classic ’60s and ’70s country music, jazz, funk and southern rock. A fine collaborative effort between two uniquely gifted musicians is bound to be a revelation to traditional music fans around the world on several counts. Trey Hensley, who’s made the transition from hot-shot guitar phenom to well-rounded instrumental and vocal powerhouse look easy, is a young Tennessee Native bursting with talent. Trey performed on the Grand Ole Opry when he was 11, and through the years, has had the opportunity to perform with the likes of Marty Stuart, Earl Scruggs, Johnny and June Carter Cash, Charlie Daniels, The Oak Ridge Boys and Ricky Skaggs. With a voice which resembles the great country singing icons of the genre’s first golden era, Trey Hensley is double threat as he can seriously burn up the fretboard too! Rob Ickes is considered one of the most innovative Dobro players on the scene today, contributing signature technique and greatly expanding the boundaries of the instrument. He won the International Bluegrass Music Association’s Dobro Player of the Year award for a record-setting fifteenth time in 2013, and is founding member of the esteemed bluegrass band Blue Highway. Born and raised in the San Francisco Bay area, Ickes is an active session player and has collaborated with a wide range of musicians, including Merle Haggard, Earl Scruggs, Tony Rice, Alison Krauss, Willie Nelson, David Lee Roth, Dolly Parton and Mary Chapin Carpenter. Together, their debut Compass Records release, Before The Sun Goes Down, earned a nomination for the Best Bluegrass Album Grammy in 2015. Hot on the recent release of their new project, The Country Blues, builds on the first album’s strengths to take their unique musical conversation to an even higher level. Rob Ickes & Trey Hensley have been across the US, Europe twice this year and this will be their very first visit to Australia this month. Joining them for one incredible night of acoustic roots brilliance, on Thursday 17th November at the Northcote Social Club, is Melbourne’s own Davidson Brothers. These boys live and breathe bluegrass. Making music together for over 20 years, Hamish & Lachie continue to firmly carve their contemporary style into the Australian music scene; performing festivals across the country from Meredith to Woodford to Tamworth and everywhere in between. Thurs 17 Nov – Northcote Social Club, Melbourne VIC – with the Davidson Brothers. The folks from MountainGrass have just told me of a raffle that is running this year. Laurie Grundy one of our most accomplished banjo makers has just donated one of his newly finished banjos as first prize. You can purchase your raffle tickets from iWannaTicket when you buy your festival tickets, or at the festival. The raffle will be drawn on Sunday November 20th. Hardshell Gaudian case with shoulder strap. Tickets for the raffle and the MountainGrass Festival are available here.